The most stunning and delicious fresh melon “cake” that everyone will love — and it’s vegan, dairy-free and gluten-free! 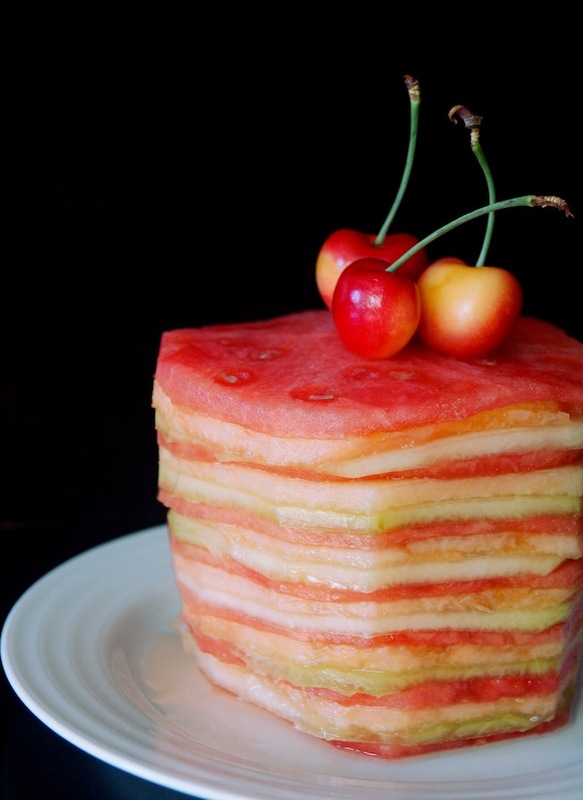 For a while now, I’ve been imagining how pretty super thin melon slices would be stacked together — in the form of a cake. I’m not the first to think of a cake made of fresh melon — but, I’ve never seen one quite like this. This is one idea that’s been on my want-to-do list for a long time, and I’m super excited to share it with you today! 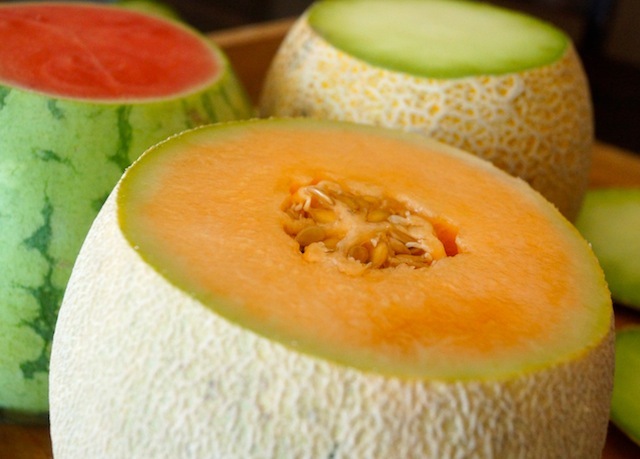 Summer melons are so incredibly sweet and tasty, it’s no wonder they’re the perfect ingredients for a cake! Wouldn’t this make for the most awesome centerpiece at your next party? On the dessert table? Or a brunch table? You could even stick a few tall, skinny candles in it and call it a birthday cake! Why not!? And it’ll match the most spectacular of fireworks on the 4th of July! We can’t really go on without pausing to admire the beauty here — the colors are stunning. 100% natural beauty! Now we can begin. The format will be a bit different today, as I’m taking you through the instructions with images. Off we go . . . 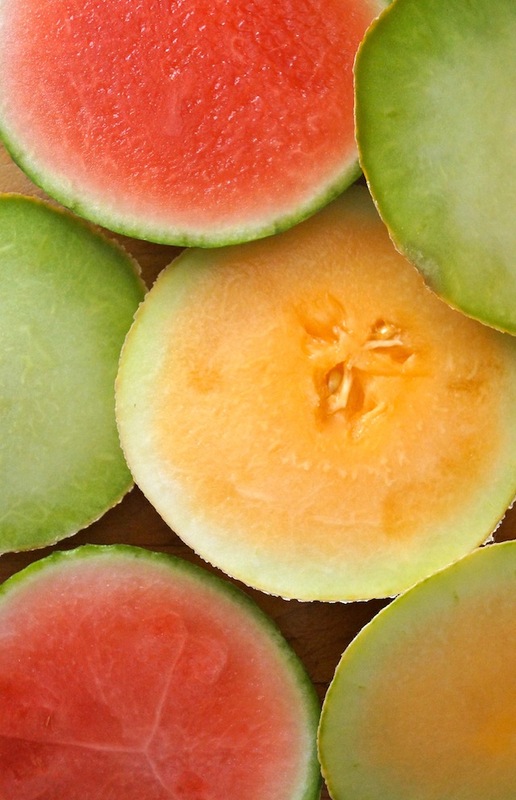 Step 1: Cut about an inch or so off the top and bottom of each melon. Again, pausing to appreciate how pretty everything is . . . . Be sure as you create this masterpiece, to save all of the scraps. They are delicious, and you might need to use them later. 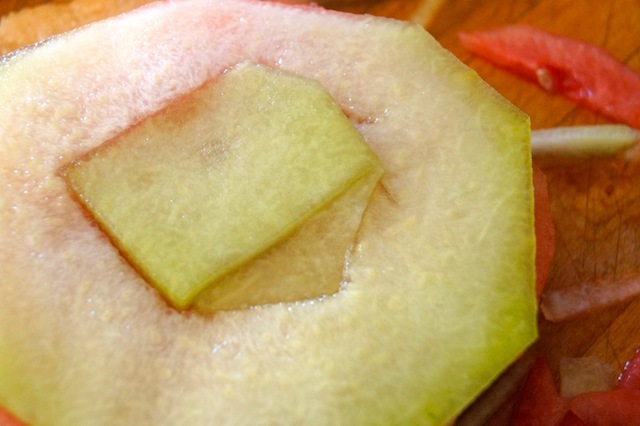 Step 2: Set each melon on one of its bases and then use a Chef’s knife to remove the skin, cutting about ½-inch inside of it, and slowly working the knife down to the bottom, curving along the shape of the melon as you go. 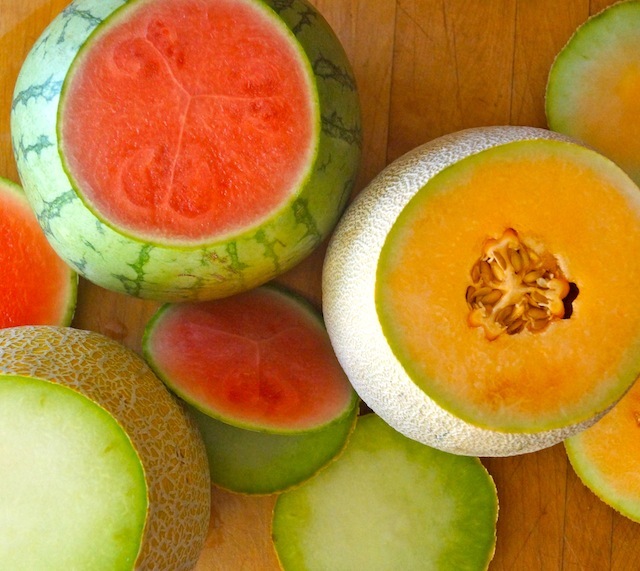 Once you’ve removed the skin from all of the melons, set the scraps aside to prepare for the next step. 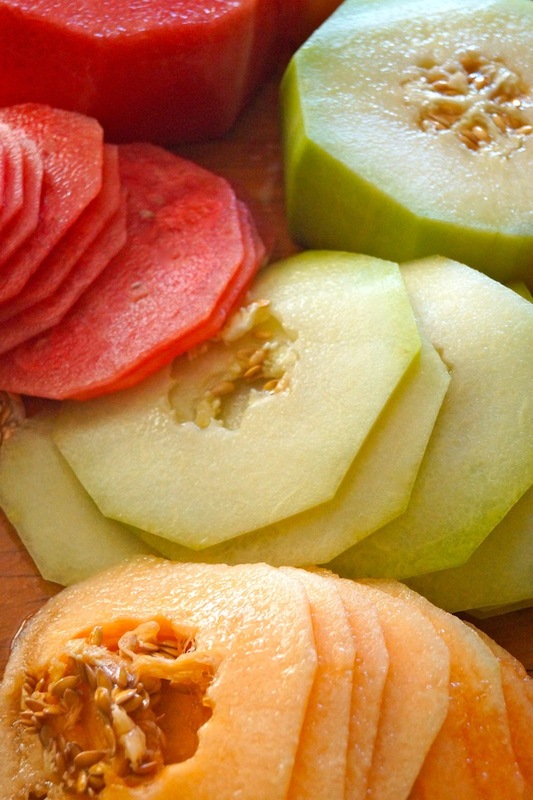 Step 4: Except for the watermelon, very gently lay each melon slice flat and use a paring knife to cut out the seeds. If they’re pretty even in shape, you can stack a few at a time to do this. 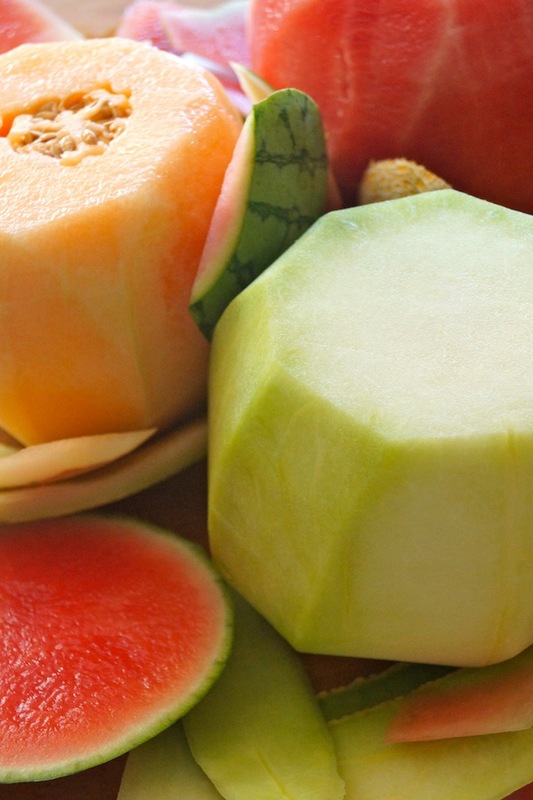 Don’t worry about the particular shape you cut, but remove as little of the melon flesh as possible. Step 5: Starting with a watermelon slice (because it’s the strongest), begin to stack the slices, alternating colors. Every time you get to a slice with a center hole, cut a thin slice from its remaining other half — it should be the same thickness, and do your best to cut it to fit the space. It will look something like this . 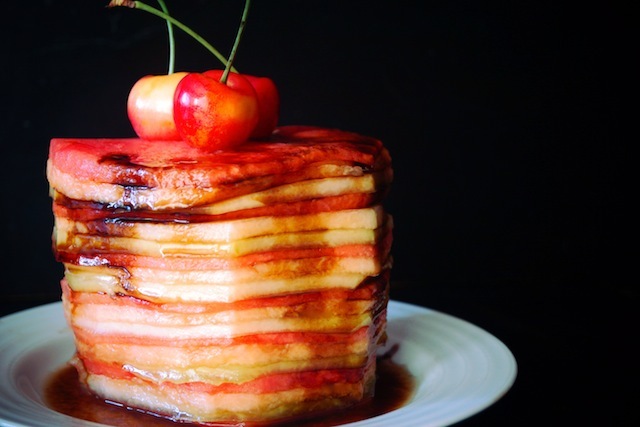 . .
Continue to stack the slices — filling in the center holes when need be — until you’ve used up the slices, or made it as tall as you’d like to. Be sure to end with a watermelon slice. Step 6: You can leave your “cake” as it is, with uneven edges — which still looks cool — or, you can use a Chef’s knife to very gently cut, starting at the top, all way to the bottom, to create even edges. This cutting process is much like when we removed the skin from the melons, only you won’t be curving the knife — these should be straight cuts. Step 7: Use a very large metal, firm spatula to carefully lift the structure off of your work space to and onto a plate. Steady and slow! It’s pretty lovely as it is, but let’s move on to step 8, and make the balsamic glaze. Step 8: At any point while you’ve making the cake, you can make the balsamic glaze. 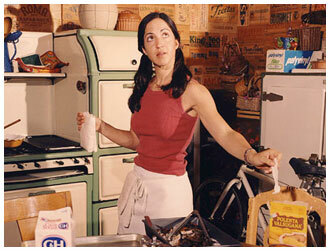 Simply pour the vinegar into a small saucepan and place it over medium heat. Once it’s bubbling, turn the heat to low and continue to simmer until it’s reduced by about ¾, and is thick. Remove it from the heat. Cool to room temperature and drizzle it over the cake right before you’re ready to serve. Step 9: Add a few cherries on top for garnish. You can slice this just as you would a regular cake. And it’s just as lovely on its side. Anyone you serve this to will know it has been made with love. How incredibly beautiful, Valentina! Like stained glass! ooh la la, stained glass! I love it, David. Thank you! What a genius idea! Fresh, Delicious and Light! You’ve improved upon nature! Brava, Valentina! It’s just beautiful! You are brilliant! Not only is this visually appealing, it’s a cake you can eat and feel good about. And the balsamic syrup…….I don’t think I ever had a dish with balsamic vinegar that I didn’t like. Nicely done! OMG! That’s amazing cake and amazing photography. This is so pretty! I love the three different colours all layered up. Such a fun idea. Thanks, Becca. Fun to make, too. Oh my… If summer had a flavor, I am willing to bet that this would be it!